Caption slip reads: "Photographer: Swaim. Date: 1951-09-06. Reporter: Swaim. 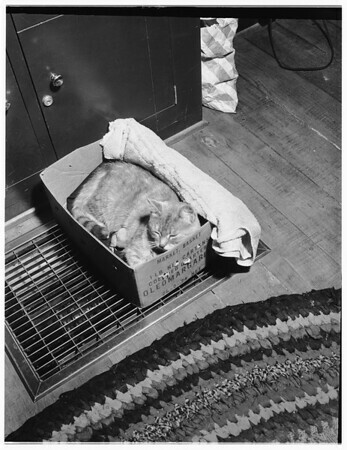 Assignment: Cat hatches, mothers chicks, Sierra Madre. K3, 4, 5, 19, 20: 'Puff', 5-year-old gray cat, mothering baby bantam chicks, on whose eggs she sat to complete their hatching when bantam hen was killed by dog".